The Cut Foot Sioux spawning site is located east of the Highway 46 bridge that crosses the channel connecting Cut Foot Sioux and Little Cut Foot Sioux lakes. Walleye eggs have been collected at this site since the 1920's. Walleye in Lake Winnibigoshish return to this site to spawn because of the warmer, flowing water. Cut Foot Sioux and Little Cut Foot Sioux are two of many natural spawning areas in the system. The Cut Foot Sioux walleye spawning operation is one of the largest in the state and typically starts around April 20th and lasts about 10 days. The timing and duration of the spawning run is variable and dependent on spring weather. 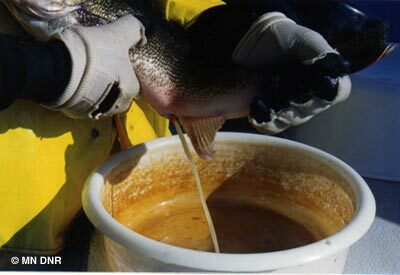 In an average year, over 25,000 walleye are handled and 1,000 quarts of eggs are collected. However, these numbers can vary depending on the weather, abundance of fish, and statewide needs. The spawning site at Cutfoot Sioux is part of a larger statewide walleye program. Eggs are transported to hatcheries in Grand Rapids, Glenwood, Waterville, St. Paul, and others. It is more efficient to collect eggs from several larger spawning runs than to operate many smaller runs. Likewise, in the fall, walleye fingerlings are transported from other areas to Grand Rapids. If you have any questions about the timing of the walleye run call the Grand Rapids area fisheries office. Download a map for directions to the spawn site.